Have you been walking around lately thinking “why does my dog ignore me?” Maybe you’re wondering if you’ve done something to piss him off, and he’s getting back at you. Maybe he’s just being bratty? Bratty is possible, getting back at you…not. Have you considered the possibility he can’t hear you? Perhaps he’s become a bit confused and not sure what’s going on? These two scenarios are much more realistic and should be explored further. Age does not automatically bring loss of hearing, but if your dog is not coming when called, doesn’t seem to hear when people enter the room or even your home, doesn’t react to noise like he used to, hearing loss is one possibility. Drop some keys behind him and see how he reacts. Does he turn his head? Do his ears move? Does he turn around at some point – how quickly or slowly? What, you expected something more high tech? I’m afraid there’s not a lot you can do about hearing loss as a result of aging. What you can do is make sure you have his ears checked during his twice yearly checkups, and ask your vet if you should be cleaning your dog’s ears regularly, how and with what product. If he has an infection or something similar that is causing the hearing loss, treating it may resolve it. Here is a link to an in-depth post about this issue, with lots of helpful information including how to communicate with a dog suffering from partial or total hearing loss. 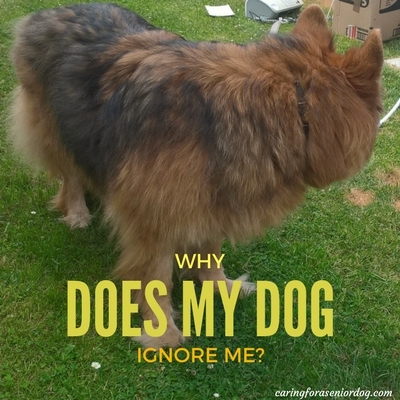 Another possible reason your dog is “ignoring” you is confusion, or more accurately doggie dementia or canine cognitive dysfunction (CCD). Dementia in dogs, as in humans, causes confusion and your dog may not understand what you’re asking of him. My senior dog Red suffers from dementia and when she’s having a bit of an episode where she’s circling, it’s like she can’t hear me. There are two drugs typically prescribed for dementia – Selgian in the UK and Anipryl in the U.S. There are also several “natural” treatments used with success by many. If you’d like to learn more about possible alternatives, I recommend you speak to a holistic vet. Based on my own experience, seriously consider starting your dog on the dementia medication, then feel free to investigate other options. At least you’ve gotten him/her started on something faster acting, then alternatives can be added if you wish. I noticed a change in Red within just a few days of taking Selgian. Providing your dog with mental stimulation such as games and puzzles, can help keep the brain active. A healthy lifestyle with a wholesome nutritious diet can help our pets either stave off some of these conditions, or at least be in better shape to handle them. Keeping an eye on your dog and calling attention to even the slightest changes in behaviour, can go a long way to nipping a problem in the bud. A problem caught earlier is certainly easier to deal with. Your vet is an important partner in helping with the health and wellness of your dog, so call him with any concerns. Don’t be uncomfortable calling, feeling like you’re making a big deal out of nothing. I never hesitate to call my vet’s office when I know something is off with Red. I know her well enough to realise when something isn’t right, and I’m always right. I could say “unfortunately” but I also know a problem caught early stands a much better chance of being treated, or at least managed. What signs or behaviour changes have you noticed in your dog? What conclusion did your vet come to, and what’s been decided in terms of treatment and care? Sharing helps others so please leave your comments below, or on my Facebook page. OMG, my heart broke watching sweet little Red walking in circles like that. Poor baby. This is a great post, very helpful information about hearing loss and dementia in dogs. Thanks for sharing. Thanks Cathy. I know it is heartbreaking, but the only time she doesn’t circle is when she’s sitting with me. Dementia, combined with vestibular disease really is horrible. I suspect it will be coming down to a quality of life issue. you, but that it could be a sign that something physically or mentally is wrong with them and they should be checked out by a medical professional. Hi Kelly, thanks for sharing that. Your pup was lucky you realised when something wasn’t quite “right.” Unfortunately a lot of people think their dogs can be spiteful and just ignore them, when in fact it’s a sign of a problem of some sort. It’s so important to know our dogs so we can recognise even the slightest changes in behaviour. I would worry if Mr. N blew me off. It’s definitely not like him and we would be heading to the vet! We try to fit in a lot of mental stimulation activities in his life. Mr N is lucky you know him so well and would recognise even small changes in behaviour. Providing mental stimulation in whatever form, is definitely an important part of caring for our dogs. It is sad when you start noticing the changes, the slowing down, loss of interest. You’re right they absolutely deserve a lot more patience and understanding from us, as stressful as caring for an aging unwell dog can be. This is a great post that everyone with a pet should read. Hearing loss can certainly occur but I never thought about dementia. Red is doing wonderfully! Thank you Heather, very kind of you to say. I never thought of dementia either until we couldn’t figure out what was wrong with Red. Sadly it’s gotten a bit worse and is really affecting her now. Thank you for this. I am going to have Lyla’s ears checked since she is 8 years old now. I do not feel she is always ignoring me but you have to get her attention at times especially if she is really relaxed. Maybe she is just spacing out gazing outside but I want to know for sure. Happy I could help Joely. It is a good idea to check out any changes you’re starting to notice, no matter how minor they are. Something caught early has the best chance of a successful resolution, or at least of slowing down its progression. Let me know how Lyla’s doing. I never thought about hearing loss being the cause of your pet ignoring you. You always share such valuable information and recommendations for senior dogs. What a kind and thoughtful thing to say – that means a lot. There are valuable tips here for anyone with an older dog. They will help you pinpoint what is wrong, and help you take the right steps to put it right, or introduce remedies to help your dog. Red is in the right hands. Every dog should have his kind of loving help nd home.. Thanks very much Marjorie, I appreciate that. What’s worth mentioning is so much of the advice often applies to dogs of all ages, and yes sometimes even cats!! Ruby’s hearing is fine and she has separation anxiety and pretty much never ignores me. LOL However, our cat Rosie has recently lost her hearing. She’s always been a bit independent and I did think she was just ignoring me at first. But then I noticed that she didn’t always hear me come down the stairs in the morning (totally unlike her) and our vet confirmed that her hearing is almost totally gone. I’m sorry to hear about Rosie. I don’t blame you for thinking she was ignoring you for awhile. I remember calling my cats and you know when they’re sitting in front of you and you don’t even realise it? That’s what some of them would do – they heard me they just wouldn’t bother to respond the little darlings!! Does your vet know how she lost her hearing so suddenly? Although my husband and I often joke that one of my dogs (Chipper) is demented since he isn’t too bright, I didn’t realize that dogs actually get dementia. Great video – now I know what to watch for. Dementia is not a nice disease, so if your dog displays any changes in behaviour, particularly any of the “typical” signs of dementia, please take him to the vet as soon as possible. Although dementia can’t be cured, medication and supplements can slow it’s ugly halt. This is hard to watch yet most of us will have to deal with it at some point. Thanks for posting. I know a friend whose hound is experiencing some dementia is using some vet prescribed edibles and they are helping a lot. She also started crating the dog – who’d never been crated before -and the dog loves it. I think talking to others who have been through this can really help. It’s very hard to watch which is why she sits with me most of the day, and I work on my website on the couch with her. Do you happen to know what the vet prescribed? I imagine her dog feels secure in an enclosed space. 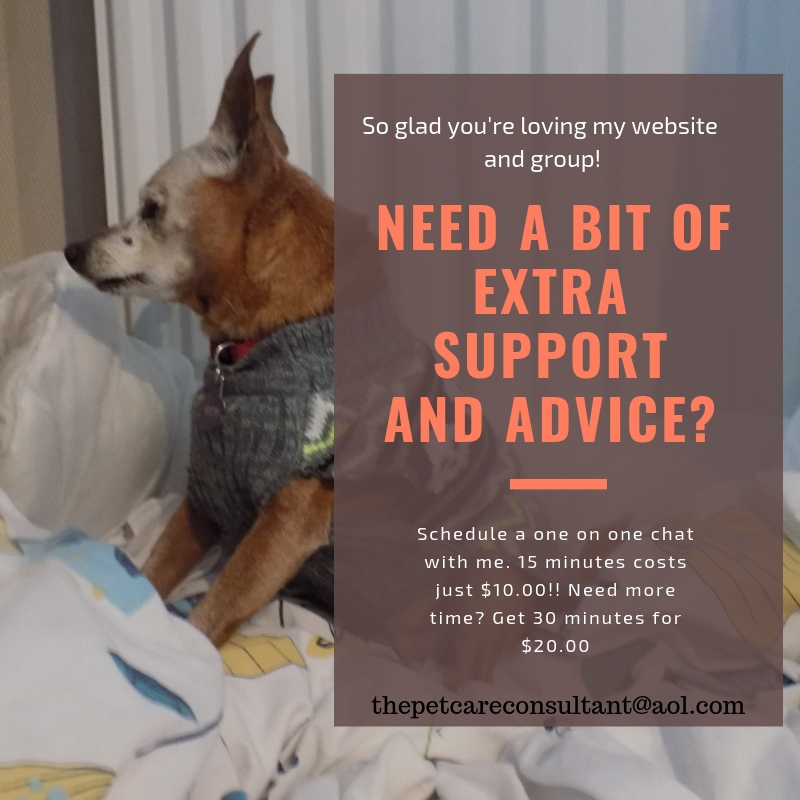 I created my FB group Senior Dog Care Club for just that reason, a place for people to go and share experiences, ask for advice, and just be with other people who can relate to what they’re going through.